This place is definitely IG-worthy! 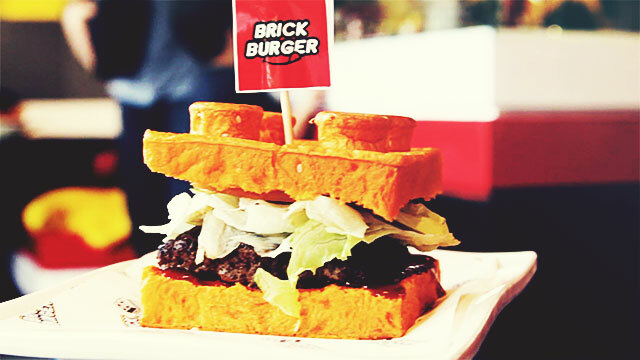 Brick Burger, the first ever Lego-themed restaurant in the country, is finally open. The owner, who wants to remain anonymous, shared that he loves to create replicas of establishments out of Lego bricks. Among his creations are miniature recreations of the stalls of Jollibee, Andoks, Mercury Drug, and Angel's Hamburger, and even public utility vehicles. He came up with the idea of building the Pasig-based restaurant after assembling a brandless establishment. "One time, gumawa ako ng scale model na walang brand. Pinangalanan ko siyang Brick Burger tapos pinagaya ko sa architect," he shares. "Pati yung chairs and tables pinakopya ko kasi gusto ko magmukhang legit Lego restaurant." The result is small restaurant well-decorated with Legos everywhere. It's the kind of joint where you'll be spending more time snapping that chewing. But that doesn't the food is not up-to-par. Their burgers, for instance, not only taste good; they're also, well, synonymous with Brick Burger's design. Brick Burger, located in Hampton Gardens Arcade, C. Raymundo Ave., Maybunga, Pasig City, is open from Monday to Sunday, 2 to 10 p.m. For more info, hit them up on Facebook.